This topic includes release notes for version 5.8. Navigation through the whole block on matching keywords of the BEGIN/END statements. To use this command, right-click either BEGIN or END, and select Jump Between Syntax Pairs on the shortcut menu. The matching pair will be highlighted. Note: you can also use shortcut keys Shift+F12. It helps you easily find a corresponding value of the specified column in INSERT statements. The command will highlight the matching column and value. Additionally, you can use shortcut keys Shift+F12 as in the Jump between BEGIN/ENDcommand. It shows a warning message that may cause data loss when executing UPDATE or DELETE statements without a WHERE clause, as well as TRUNCATE. Warnings are not shown when modifying temporary tables or temporary variables. Checkboxes are set for any environment of TRUNCATE, DELETE and UPDATE statements. 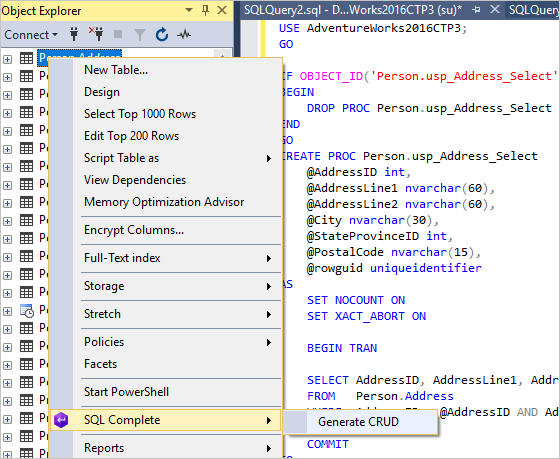 Generates a result script for SELECT, INSERT, UPDATE, and DELETE statements to a new SQL document. On the CRUD tab of the Options menu, you can select what statements to be included into the script and in what order the columns should be set. When the query execution is completed, a notification with such details as a name of the document and duration is displayed. In addition, you can enable a notification and specify execution duration on the Notifications tab of the Options menu. The notification alerts users that a transaction has not been completed if you execute a script by clicking F5 in SSMS. It contains the document name and a number of open transactions. On the Options menu, notifications for transaction reminder are selected by default. Additionally, you can set duration on the menu. Searches the required data by highlighting all the matches either by case, or whole words, or regular expressions in the results grid. In addition, you can navigate through the grid by clicking arrow keys on the Find menu. 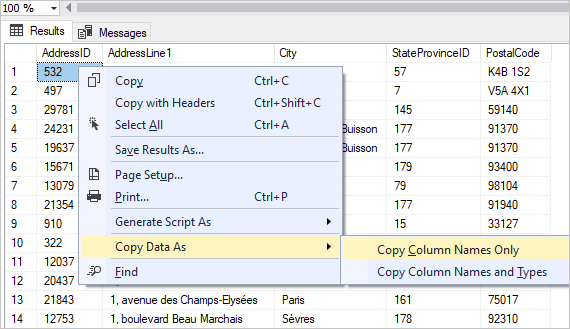 Make a copy of the selected column names and/or types to CSV, XML, HTML, and JSON data formats. Selecting two or more rows in one column automatically opens an aggregate grid that displays calculations on the SSMS status bar. Clicking the Close button on the grid, clearing highlights from rows, and selecting one or several rows in different columns will close the aggregate grid. Allows users to parse named and unnamed regions automatically, as well as wrap and unwrap regions. 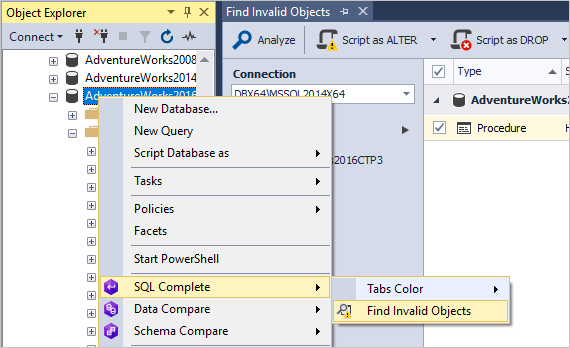 Allows users to search invalid objects in the selected database. 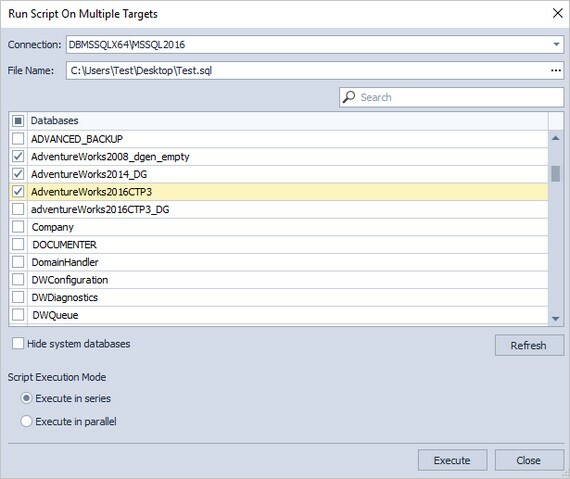 You can find invalid objects by right-clicking a database or connection in the Object Explorer and navigating to SQL Complete – Find Invalid Objects. Allows users to quickly switch between active formatting profiles, as well as edit profiles by opening the Formatting Profiles window. 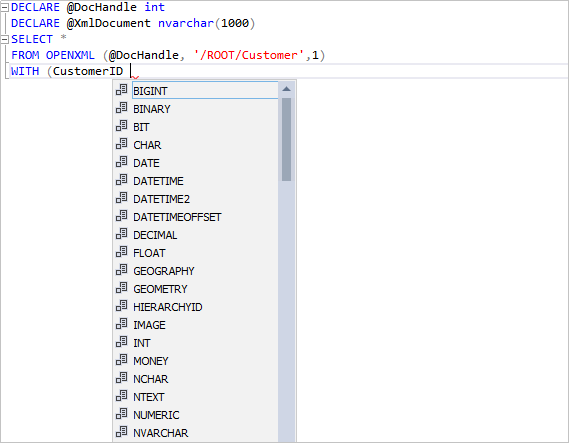 To use this feature, simply right-click anywhere on the SQL document and select Active Format Profile. Possibility to connect to Azure Multi-Factor Authentication completed!